Sometimes it pains me to look back at older post. The recipes weren’t always the best and the photos make me cringe. Yet, I leave everything up because it is good documentation on growth and development. I recently received a comment on an older post of Gallo Pinto. At first I was taken aback (I always am when people come off rude and angry) and I went to trash the comment because frankly, it’s my blog and I hate negativity. Then I re-read the comment (which was actually a recipe) for Gallo Pinto and then looked at my original recipe. The second I looked at my recipe, I knew the commenter was right and I was actually kind of upset with myself. For some of the recipes up here, I make them occasionally and then sometimes they make their way out of the rotation. Prepare rice according to package (I swear by my rice cooker now) with the addition of adding the cumin before cooking. While rice is almost done cooking, heat sunflower oil over medium heat. Add in onions and saute until the onions become translucent. Stir in peppers and garlic, continue to cook until pepper is cooked through. Stir in beans (with juice), Worcestershire sauce, and salt/pepper. Continue to cook until the liquid has mostly disappeared (about 4-5 minutes.) Stir in cooked rice and part of the cilantro (or if you want the rice separate, just stir in the cilantro.) Cook for 1-2 more minutes. Serve with extra cilantro, cooked eggs, or hot sauce. This looks delicious, i have never heard of it before. I totally agree with you. I have a lot of “what was I thinking” stuff on my blog from the first couple years, but I leave it up because it’s part of where I am today. And I have no qualms about giving some of those recipes a second chance on the blog either! You have no idea how happy this post made me! My dad is from Costa Rica and seeing anything related to the beautiful country makes me all warm and fuzzy inside. 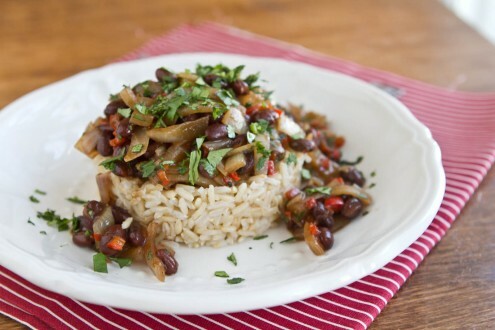 🙂 The country is so dear to my heart so I love when I see other people enjoy things from it, especially gallo pinto since it’s pretty amazing. Gallo pinto with fresh cut pineapple, mango and warm, homemade corn tortillas with cheese made from the cows on my uncle’s farm is just about the best breakfast anyone could ask for. It’s interesting to see that you put cumin in your recipe; I’ve never seen my family do that. I’ll have to try it–I love cumin. Have you traveled to CR? If so, where?? And I know what you mean about the Lizano; we always bring back at least 3 big bottles when we go there since my dad puts it on just about everything and it’s so expensive when you can actually find it in the States. I just found your blog through Pinterest and I’m enjoying it since I’m a vegetarian. I’ll make sure to check back now and again. ¡Pura vida! Hi, im a Costarican and wanted you to know that you can buy salsa lizano on line in a site called tico shopping they deliver anywhere in the us :o) i would love to share with you my recipe of gallo pinto that doesnt needed it and is as good as the one that has it, let me know if you want it…. Im costarican and I’m so happy to hear that you love our food!!! Salsa lizano is truly what makes this dish taste so good however my mom and grandma make it without it. 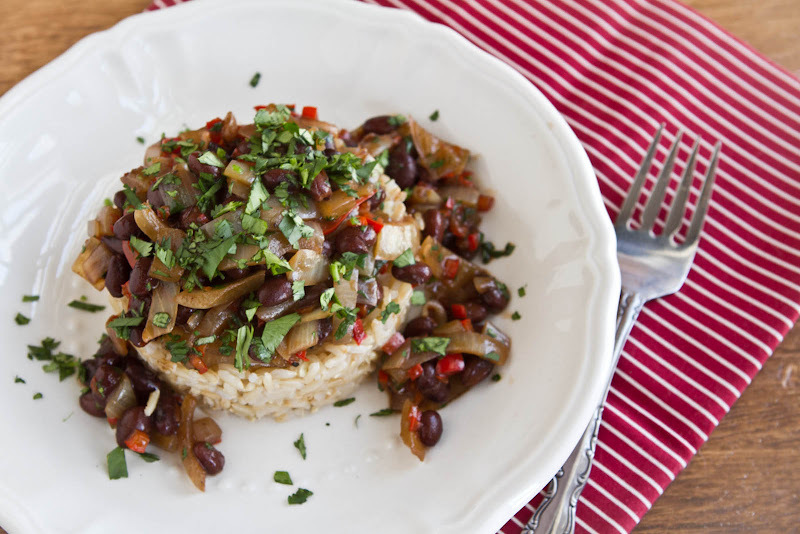 For me the best “pinto(Gallo pinto)”, is the one made with lizano sauce and “old” rice( plus all the spices and seasonings of course). Make it few days before and put it in the fridge. Take it out next morning and make your pinto. I like my rice nice and “loose”, not sticky.